My name is Lynne Butler, I am a location sound recordist with many years of experience in recording for documentary/ factual programs. I own a high quality sound recording kit specifically designed for this purpose. I started out in audio post production at the ABC and for over twenty years I’ve worked in sound as an editor of both dialogue and sound effects, foley and ADR recording as well as mixing on drama, documentary and comedy. These include Seachange, Kath and Kim and more recently ‘Please like me’ plus many, many more. Recently I’ve worked on the feature film ‘Emo – The Musical’ as the production sound mixer. On location my work includes ‘Choir of hard knocks’, ” as well as drama and TVC work. 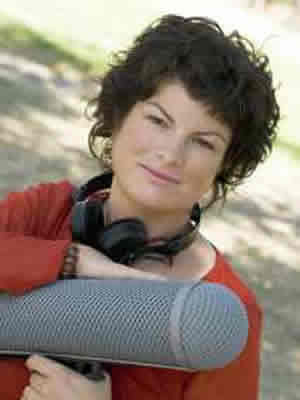 I regularly work ABC productions such as ‘Four Corners’ and ‘Australian Story’. Documentaries have taken me around Australia and abroad to places such as Uganda and Cambodia so I am experienced with travelling and working. I’m highly skilled dialogue and effects editor experienced on Pro tools and Firelight and I own the latest Protools system.